Special Systems Design, Inc. (SSDI has designed its own fully automated milling and turning equipment. Through the utilization of Excimer Laser technology and high precision automated systems, SSDI can ablate a wide range of Polymers including, but not limited to PTFE, FEP, Polyimide, Polyethylene and Polyurethane. 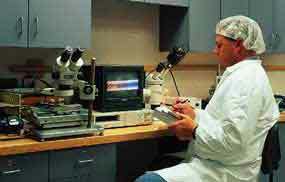 Micromachining operations such as reducing a tube or wire insulation diameter in select areas can be realized in lengths from .001" to greater than 30 cm. Processing shaft diameters as small as . 00099" and as large as .125" have been commonly done with larger sizes available upon request. This can be accomplished, cost effectively, while maintaining depths along the entire length. The holding of tolerances as tight as .0002" are possible during automated turning operations. Another direct benefit of utilizing Excimer laser technology on braided shafts is that ablation can be done to exact specifications without degrading the braid within the shaft. Multi-steps can also be accomplished to various depths along the target area of the shaft without sacrificing quality with our fully automated multi-axis proprietary systems. Precision slotting and turning operations are also made easy on multi-lumen tubing using our proprietary automated systems.